Session 406. Got down to Hampton in the late afternoon chasing the sea breeze. I rigged feverishly and headed out. Stu Styles came in soon after I started. I was keen for an adventure and could see a large cruise ship heading out from Port Melbourne along the shipping channel so I headed out for a look. I was nicely powered and making good progress on a tack towards Fawkner Beacon with the big ship making fast progress along the channel. The wind softened a bit and my tack veered to the north a bit. The ship was disappearing in the distance, I didn't get close to it, but it was a buzz being out there. The return tack was good and the wind held up as I returned then it dropped after a couple of runs close to the shore. I landed my kite and started packing up then Stuart Webb arrived and headed out. I decided to have a go on the Cabrinha Double Agent foil board in the lighter wind so I set it up and walked out next to the southern groyn. I was again having difficulty controlling the board while drying to board/body drag out. It spins and twists. I was then concerned about the reefs in the middle of the windsports section but avoided them. 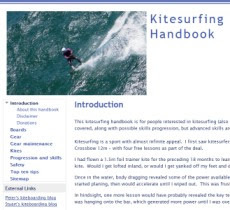 Then I finally had some deep water and was able to power up the kite and keep the board under my feet but pushed out with the foil and mast almost horizontal. It was great to get that amount of control. Then I had a go and standing up. Its a really weird feeling when the board you stand on is not the "main board" - the foil is! I got going a little but without much control. I think I should have been leaning forward more to keep the foil under, but at least I had no big stacks and kept control of the kite. Tacking back in to the right I repeated the same technique with similar control, standing up a few times but feeling very tentative about the foil lurking under the water. I got back to the beach very happy to have succeeded in short session without a big stack or crashing my kite hard. I was also able to sail the board back in flat on the water with one hand on it. Don't let anyone tell you foil board are easy - learning is like being a rank beginner again! Keep weight forward on the front foot when you are up. The wind picked up a lot to around 25 knots which didn't make it any easier. I took the Nugget out for some more runs and bigger jumps, relishing the surplus power.